We welcome new members for our choir, one of the best in southern England. We practise every Thursday evening at Sandilands, the home of Addiscombe Cricket Club. Rehearsals run from 8 to 10pm. They are fun, friendly and informal, although we also work hard. We stage about 12 concerts a year and are constantly renewing our repertoire, so there is always something new to learn. The club premises have a welcoming ambience. There is a well-stocked bar, with one or more brands of real ale on tap. On summer evenings in June and July you can stand outside and watch the cricket too. We take a break from rehearsals for approximately six weeks of the summer holidays, during late July and August. We hold informal singalongs during the summer period, when we rehearse the pieces we perform at the apres - the wind-down sessions held in local pubs after concerts. So, if this appeals to you, just come along to Sandilands one evening to see what you make of us. You can sit with the choir and sing along, or you can just sit and watch. It's best to arrive around 7.45pm. If you have not called us first, introduce yourself to any choir members you meet and they will take you in hand. You do not need to be able to read music (only around half of our members do so.) If you like singing and you can sing in tune, you can join us, and we promise that you will enjoy yourself. You will need enthusiasm, a sense of humour, and a willingness to commit to the choir. That means rehearsing once a week and learning both words and tunes, as we perform without looking at sheet music. You need to decide which "voice" you are - top tenor, tenor, baritone, or bass. If you are uncertain we can offer advice. After you have been practising with us for a few weeks, you will be asked to take a short informal audition (the pass rate is around 90%.) Then you will be awarded the choir's distinctive silver-grey jacket. From that point, you will be able to take part in our concerts and enjoy the choir to the full. If you are interested, come and take a look. The club is in Sandilands at the junction with Grimwade Avenue, CR0 5DB. (See map on "How to find CMVC" page.) Just turn up - or give us a call to let us know you are coming. 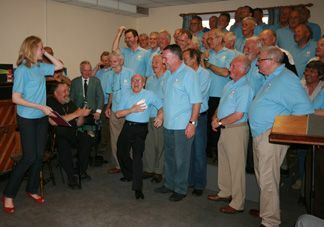 Choir chair Kimball Ormond (01689 850371) or secretary Roger Lee (020 8686 2427) would be pleased to hear from you.